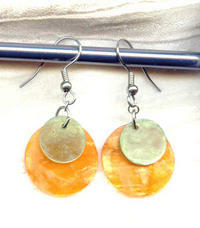 Now here's a pair of citrus-coloured earrings that are perfect for summer wear. Capiz shell is light as the proverbial feather and dyes into brilliant colours; in this instance, a 20mm disc of tangerine orange and a 13mm disc of lime green. The earrings dangle about 1-5/8" from the tops of their surgical steel French hooks. They're another pair of lightweight lovelies from SPARKLE PLENTY.